After install the Align and Distribute plug-in you will see in the Add-Ins tab two new panels with various buttons, one panel for Alignment commands and other for Distribution commands. There are two ways to align an object with Align&Distribute plug-in, by Main Command or by Quick Commands. Click on the button Align or type command ALIDEF. Specify the alignment axis, can be X, Y or Z. Specify the position, like LEFT, CENTER, RIGTH. Press enter or space and the selected objects will be aligned. Click on the button that represents the type of alignment that you want, or type his command. Tip: To better understand the action of each command, stop the mouse on the button of a command and wait for the tooltip to expand, an image describing the action of the command will be displayed. Like Align, there are two ways to distribute an object with Align&Distribute plug-in, by Main Command or by Quick Commands. Click on the button Distribute or type command DISDEF. Specify the distribution axis, can be X, Y or Z. Specify the position, like LEFT, CENTER, RIGTH or GAP. Specify the value of the spacing between each object or press enter to use the suggested spacing. Tip: The suggested spacing value is obtained by dividing the distance between the first and the last object positioned in the direction of the distribution. Press enter or space and the selected objects will be distributed. Click on the button that represents the type of distribution that you want, or type his command. Select the objects that you want to distribute. IMPORTANT: Because it is a TRIAL version each commands affects only 7 objects per selection. For a larger quantity get the paid version. 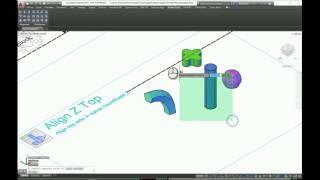 Distribute with uniform gaps between objects in axis 'Z'. Distribute top sides evenly in axis 'Z'. Align right sides in same axis 'Y'. Distribute back sides evenly in axis 'Y'. Align left sides in same axis 'Y'. Distribute centers evenly in axis 'X'. Distribute with uniform gaps between objects in axis 'Y'. Distribute with uniform gaps between objects in axis 'X'. Distribute centers evenly in axis 'Z'. Centralize in same axis 'Z'. Distribute right sides evenly in axis 'X'. Align back sides in same axis 'X'. Distribute centers evenly in axis 'Y'. Distribute left sides evenly in axis 'X'. Align front sides in same axis 'X'. Centralize in same axis 'X'. Centralize in same axis 'Y'. Distribute bottom sides evenly in axis 'Z'. Align top sides in same axis 'Z'. Align bottom sides in same axis 'Z'.